Hi everyone! It's my turn over at Twine It Up! with Trendy Twine today. 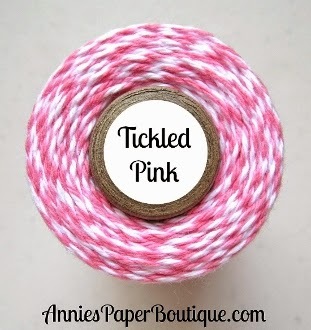 I have a quick little project with some fun Tickled Pink Trendy Twine and some other fun products from the store. 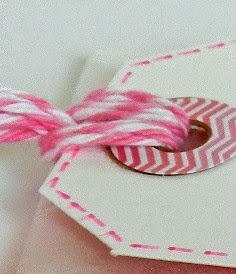 Here's a quick sneak peek--head over to the blog to see the whole project and all the details. The next challenge will post on May 1 so be sure to stop by and join in the fun! I used some Close to My Heart Markers for the pink, but they were terrible. Guess I just need to get rid of them. The yellow and green were Aqua Markers. I am loving the sequins lately and found Cartwright's website--tons of fun sequins. They came very fast too--shipped the same day I ordered! I'll have a Trendy Twine Post up on Tuesday :) You know how I LOVE my Trendy Twine! I used some fun Strawberry Cupcake Trendy Twine on the top. The feet are pop dotted on and I added some Frosted Lace Stickles. You need to draw on the whiskers and mouth--I always do one side better than the other :) The eyes will cut out, but I didn't size them correctly so I just used some stick on gems. I have a cute little chicks card to show you today. You can buy these cute stamps from Annie's Paper Boutique--the same place you can buy the fabulous Trendy Twine like the Lemon Tart I used. The stamp set is from Jillibean Soup and and you can find it in the store HERE--it's so cute!! My chicks could have been lined up a bit better, but I'm a bit out of practice at stamping image cards :) I knew I wanted to use the fabulous Lemon Tart Trendy Twine to go along with my yellow chicks. I think the paper might be Jillibean Soup too, but honestly, I pulled it out of my scrap pile. The sequins (one of my new favorite embellishments) are from Doodlebug Designs. Don't forget about the Challenge over at Twine It Up! with Trendy Twine. 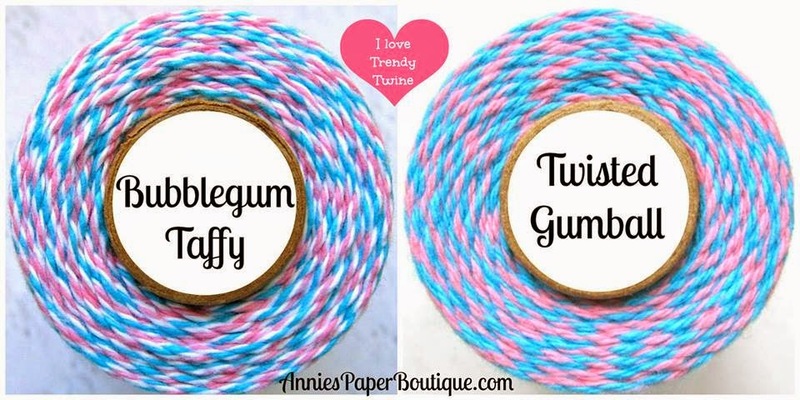 You need to have an Easter or Flower theme, real or faux stitching, and of course, some Trendy Twine! Everything, except the bunny and candy, can be found at Annie's Paper Boutique. I knew when I got these cute bunny tags that I wanted to use the marshmallow bunny peeps in them. And my daughter saw this peep bunny that had two 4 packs of bunny peeps with it. Perfect! I love the shape of this Medium Candy Rectangle Clear Box. And the row of 4 peeps was perfect for this. 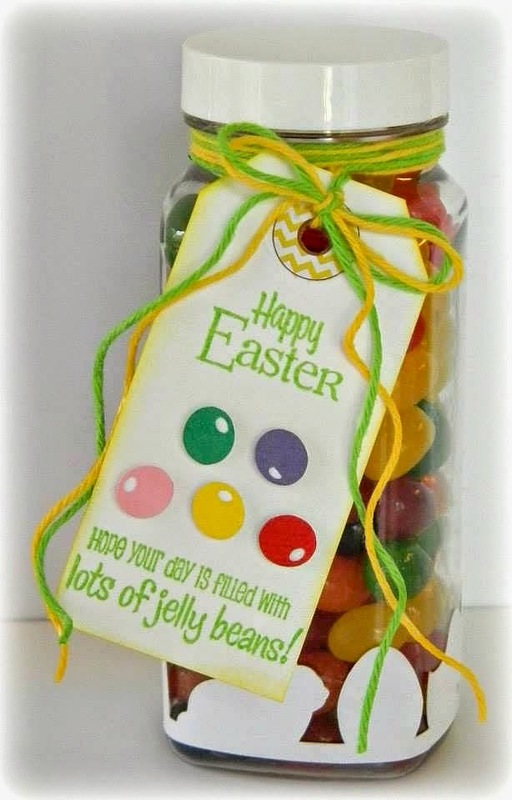 Then I just wrapped some Twisted Gumball Trendy Twine around the box so there's not so much clear showing :) The Bunny Peep Tag can also be found in the store and you can pick from 4 colors or get an assortment! Before I found the bunny peeps, I had used some Medium Candy Bags and filled them with some Whoppers candy eggs. After sealing the top, I wrapped some Bubblegum Taffy Trendy Twine around the top. I added a Bunny Peep Tag to one and a cute little Bunny Peep sticker to the front of the other. These would work for the current challenge that just started last week. Check out the details HERE. I really hope you join in and play with us!